Search Engine Optimization is key to any internet marketing strategy. SEO comes in to play at some point during the decision process for most online sales funnels. But what exactly is SEO and how do you know how much time or money to budget toward it? We have an article on our blog that you may find helpful. It answers the question: What is SEO? Here are two quick steps to fix your SEO problems. 1 – Use the FREE site scan tool that looks at 20 factors on your website and two of your competitors when you click “Options”. It tells you why you aren’t ranking as high as you could be. 2 – We have marketing strategists that are happy to talk with you about your site and develop a plan to meet your expectations. They will walk you though your report and explain each detail. A good place to start is by scanning your site. Be sure to utilize the “Options” to compare your SEO to your known competitors. Then one of our strategists can go over your report with you and help analyze what needs to be done for your site. Take a look at the report and see how you can improve your website. SEO has a lot of jargon and can be difficult to understand. Call one of our experts to walk you through your free SEO report. What is our secret formula you ask? We will help you grow your site’s network of backlinks into a web that search spiders won’t want to leave. We check keywords, density, tags, ratios and about 400 other factors to make sure your page has the advantage.  Firetoss has mastered geographically targeted search engine strategies to help drive actual customers to your location. Over 60% of buyers use the web in pursuit of your brick and mortar. Our Social Media Strategist formulate the perfect mixture of platforms and tools to fit your needs. We know how to engage and retain users. Do you need help right now? Fill out our contact form and someone will reach out to help!